Tracey and I split the 5.50 chicken plate. Comes with half a chicken, greenbeans burgoo and 2 cornbread pancakes. mmm. Dilled summer squash with onion and zuch in the front, apple pork medallions in the back. And brown rice. I cannot, do not cook red meat. Joe on the other hand did a wonderful job. It was tender and sweet. If there were bones in tenderloin, this would've fallen off them. I was very proud of him for taking his day off to shop and cook for me-- er, and Matt who came over last night. We ended the evening with kit kats and a jam session that included guitar, a chinese flute and bongos--singing worship songs and a group-effort original about purple hat. I'm going to save us the embarassment of included the rest of the lyrics. Melinda told me about putting won ton skins into mini muffin pans to crisp in the oven... so I tried it. They were very crunchy, probably because I filled them with raw meat instead of cooked. IT was still good. Plus I like the name meat blossoms, which Joe came up with after I insisted they looked like flowers. Tuesdays are my cooking/English exchange classes. This time, I went over to Saya's place and met her friend Yakemi (I think I remembered that right?). They taught me how to make a dish that is popular for birthdays and holidays. To make it, start with steamed short grain rice. Saya added sugar and salt to rice vinegar then Akemi cut the mixture into the steaming rice. Saya handed me a plastic aristocats fan... so I could help cool the rice. Though the flowers on my other plant were razored right off by some bug with a predilection for tender tomato stems, I discovered I have (at least) ONE TOMATO! Yipppeee! We know we aren't really supposed to be baby peeping this late in the game, but the birds were very still-- they didn't seem the least bit inclined to jump for freedom. Notice the blue feathers that have popped free of their sheaths. Yesterday morning, after spying on the blues, I noticed how photogenic some of Mr. Morris' vegetables were. I love the cabbages especially. And here's a nice head of brussels sprouts. And the corn leaves have finally gone wavy after our recent shower-- they were previously stiff and pointy from the drought. Mom and Dad said we shouldn't talk to strangers. Plus, you didn't bring any bugs. Don't worry, Dad is watching you from above. I made my own Udon Monday night. I think they came out pretty good. I like the way they become a little softer the second day. Recently I've decided to spend every Tuesday afternoon with my nieghbor, Saya. This past Tuesday we made garden zucchini muffins (what, you didn't think they'd last long enough to get their picture taken, did you?) and talked about the different kinds of accents in Shrek 3 and in various Japanese cities. Next week, I'm hoping she'll bring another Japanese friend. I miss my English-teaching days at ortv. Update: Here's the column I wrote about making noodles from scratch. I love hot noodle soup on a winter day. And even in summer, I don’t mind slurping steaming broth in an air-conditioned kitchen.The air conditioning at our neighbors Taizo and Sayaka Yasuda’s place was emitting little more than a rumble and a wheeze recently when my husband Joe and I went over to learn how to make Japanese udon noodle soup. As the sun streamed through their apartment’s many windows, I think we would’ve all been suffering if it wasn’t for several cups of iced coffee and green tea. The beverages whet our appetites for our own handiwork: Cold chewy noodles, dressed with toasted sesame seeds, and dripping with a chilled broth. Well it might seem unconventional, but Asians eat cold noodle dishes just as Americans scoop up the pasta salad. Both are cooling comfort foods. Conversely, many Asians would rather eat their salad greens in a stir fry. To make the udon dough, Taizo instructed, use 1 cup all-purpose flour and 1/2 cup bread flour and a 1/2 teaspoon salt (or to taste). In a medium bowl, combine flour and salt and add water a tablespoon at a time, stirring with your finger tips until all the flour is moistened. Joe and Taizo were the ones donning aprons — kneading noodle dough is a man’s job. They pounded the balls of flour and water for 10 or 15 minutes, and looked a little winded when the process was over. At this point, drink another glass of green tea, if needed.When the dough was smooth, and a little firmer than the consistency of Play-Doh, Taizo divided it into two balls. Next, he pushed a divot in the center of each ball with his index finger and pinched the opening shut, as if to trap a little bit of air inside each lump. He placed the dough, puckered sides down, in a bowl covered loosely with a dish towel. While the balls rested at room temperature for an hour, we played UNO and drank more tea. Next, Taizo placed a spoonful of cornstarch onto the counter, spreading some on his hands, on a rolling pin and on one dough ball before he rolled it into a large rectangle.He slathered more cornstarch onto the surface of the dough.“Cornstarch is very, very important,” Saya stressed.“So it won’t stick together,” Taizo explained. Next he guided Joe to fold his sheet of dough into thirds long-ways, to make cutting the individual noodles easier. A sharp non-serrated knife works best for slicing the entire slab of dough into 1/8 inch-thick strips. The ample cornstarch allowed us to uncoil the noodles and bundle them in groups of 7-10 noodles. I noticed Taizo would gently coax stubbier noodles into a more slender form — keeping the length of noodles in each bundle consistent. As our udon began to take shape, Saya put a pot of salted water to boil on high heat and prepared an ice bath in the sink as well as a colander over a bowl.When all the dough was cut and all the noodles divided into easy-to-grab bundles, our noodle-making assembly line began. Saya grabbed the noodles, a bundle at a time, and dropped them into the boiling water. She swished them with chopsticks to keep them from sticking, and a cloud of cornstarch billowed from the noodles. In a few seconds, the noodles turned from white to pale yellow, and she scooped them from the pot to the ice bath. A moment later, Taizo scooped the noodles into the colander for a quick rinse and drain. In about 10 minutes all the noodles were cooked, chilled and ready to comfort. There were four faintly blue eggs, but over the weekend that we were in Chicago, one of them disappeared. The three hatchlings seem to be healthy, but with the heat and drought, I think they're more sluggish than last years baby bluebirds. At least they're lazing about with beaks wide open :-) Joe took this photo this morning. I'm trying out Blogger Draft to upload video... I think I prefer embedding YouTube video. What do you think? My uncle Doug was the main reason we went to Chicago this past weekend. As a major in the National Guard, Doug has been serving in Afghanistan for the last several months. Joe and I got to celebrate his birthday with him at Giordano's in Evanston on Tuesday. We arrived right at opening time (11:00) and had the entire restuarant to ourselves. We had a deep dish pizza - half spinach and half veggie, with fresh basil from Whole Foods down the street. It was disappointing that Giordano's didn't offer basil as a topping for pizza. But Evanston, home of Northwestern University, is one of those towns that has every kind of edible necessity close at hand or close on foot in this case. No trip to Roger's Park would be complete without a stop at Chiu Quon bakery, a simple shop on Argyle that we've been visiting as long as I can remember... with some of the same women behind the counter for as long as I can remember! Argyle isn't really another chinatown anymore, it's more like a little south pacific. A little pan-Asian archepelago of pho shops and groceries and gift shops. But I remember when it was mostly Cantonese (the Chinese provence where Hong Kong is and from where my mom's parents came). I used to think all Chinese bakeries were like Chiu Quon, but with time and travel, I've learned it's unique. Most Asian bakeries these days individually wrap their buns and pasteries in stiff plastic bags-- so you can't be entirely sure of their freshness or fragrance. Chiu Quon still houses trays of fresh goods behind a curved glass case. Several trays overflow to the top of the counter, uncovered-- sometimes still cooling. In Taiwan there's really a rich variety of bun fillings-- taro, pumpkin, pork floss to name a few. The offerings were dynamic, morphing with the trends. But not Chiu Quon. They have had the same things for as long as I can remember. And it's comforting somehow. Mom and I filled a white box with 2 ham and egg buns for Mom, a winter melon cake for Joe, a coconut bun and a paper-wrapped sponge cake for me and a pineapple turnover for Dad. After Blue Man Group, we walked down Halsted to Arco de Cuchilleros (I think that's what it was called) for tapas and paella. Yup, got my hair cut that morning. Spanish omelet with potato and onion... more like a crustless quiche. Very tasty. Paella with chicken, squid, clams and mussels. All cooked perfectly with saffron rice. Saturday has been a very full, fun day. After our Japanese lunch, we headed to the Lake View neighborhood to see Blue Man Group at the Briar Street Theatre. Out of the 500 people in the audience, those 3 blue men chose my mom to come up to the stage and partake in all their hilarious weirdness. 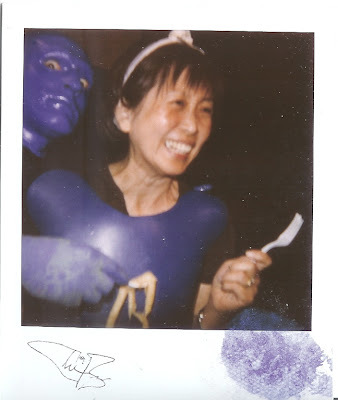 No picture taking was allowed during the performance, but they were nice enough to shove a polaroid in her face as they made some kind of weird apple goo come out of the blue man outfit that they put on her. Most wonderful Japanese salad ever. Good dressing: grated diakon, ginger, vinegar and sugar... and something to make it orange. Warm pan fried tofu cubes. Broccoli sprouts. Also a very non-fishy seaweed salad with ample toasted sesame and delicate jellyfish strands. The new restaurant set to fill the Bart's building in downtown hoptown is scheduled to open at the end of summer... but the new owners still haven't pinned down their menu. So since it is unlikely they will open a Thai or Japanese or even a good Chinese restaurant there, I have another idea: Za's. It's fast-Italian DIY pasta, salad, pizza and panini. It's casual, but not like the chains. In fact, I'm pretty sure there's only two locations, and they're both in Champaign. Joe and I had dinner there friday on our way back to Chicago for an extended weekend to visit with family and eat as much good food as possible. I ordered pesto tri-color rotini with spicy chicken, broccoli and mushrooms. Joe had the pesto pomodoro panini. Alliterative and delicious. But back to the case for opening a Za's-like restaurant in Hopkinsville... The town has no Italian restaurants... which in my book is just a crying shame. We could really use a good sit-down restaurant that has snappy service and allows diners to completely customize their meals. When we were living in Taipei, Joe and I brought our lunch with us to work (we also had over an hour for lunch, with a built-in nap time that was strictly enforced.) One of the dishes I liked to bring was my own version of temaki-- or sushi handrolls. My version included things I liked: omelet strips in rice vinegar, imitation crab, cucumber sticks, pencil-thin asparagus and other veggies like sprouts. The weird part about my temaki is that I don't use rice-- which sort of makes it not sushi. But it tastes good with sushi rice as well. I'm just lazy. My mom brought me some packages of seaweed sheets when they visited... so I felt compelled to make my rice-less temaki. I was visiting my mum (or aster?) in the backyard at lunch and found this shy little bug basking in the sun. I tormented him for a brief while, sticking my lens right in his frightened little face. Initially, he kept switching sides on the leaf. Where ever I would go, he'd move to the opposite side. He finally jumped after I took this last shot. Nothing like a bowl of cold noodles on a hot summer day. The first time I ate cold noodles that were not in the form of macaroni salad was with my friend Lisa, who made me chilled Korean buckwheat noodles when we were in college at Case. Since that time, I was emboldened to order cold noodle dishes at restaurants and when we lived in Taipei. This little food storyline had sort of trailed off until yesterday, when Joe and I learned to make Japanese Udon from scratch. Our awesome neighbors, Tai and Saya, have a hard time obtaining Japanese food here. Tai began making his own udon noodles to fill a craving. Slowly add water to the flour until a dough is formed, if it becomes too sticky, add more flour. Taizo seemed to add just a tablespoon of water, then after he'd formed a dough ball with some of the flour, he'd add more water and use the existing dough ball to grab up more dry flour. The dough balls need to sit at room temp for 1-2 hours. We played UNO during that time. Then roll out the dough into a large thin rectangle. Give it a very generous coating of cornstarch before folding it into fourths longways. Use a sharp knife to cut it into strips. Unfold strips and loosely bundle about ten noodles on a plate (makes it easier to throw them in the pot). Bring water to a boil on high with some salt. Swish a few bundles of noodles into the water, and pull them out when they change from white to slightly yellow. Immediately rinse them in cold water and/or swish in an icewater bath. Drain in a collander before serving. In addition to cold noodles dressed in a thin fish broth, sesame seeds,green onions and seaweed, Taizo also made Osaka-style okinomiyaki. To see more photos of our Japanese homestyle cooking class visit my Ringo album.